Force variability is affected by environmental temperature, but whether the changes are from altered muscle temperature or proprioception are unclear. We tested how forearm muscle warming and cooling affected a force tracking task. Twelve males and four females completed evoked, maximal, and isometric wrist flexion contractions (0–30% maximal) during thermoneutral-, warm-, and cold-muscle conditions. Forearm muscle temperature was manipulated using neutral (~ 33 °C), hot (~ 44 °C), or cold (~ 13 °C) water circulated through a tube-lined sleeve. Evoked and voluntary contractions were performed before and after thermal manipulations. Thermal manipulations altered contractile properties as evident in the twitch half-relaxation time, rate of force development, and duration (all P < 0.05), suggesting that muscle temperature was successfully altered. 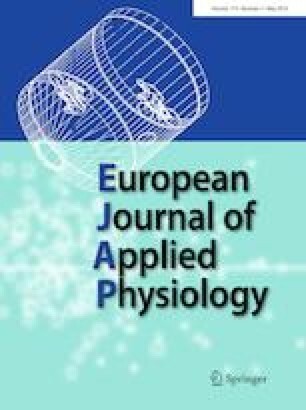 Changes in surface electromyography of the flexor carpi radialis root-mean-square amplitude and mean power frequency between temperature conditions (all P < 0.05) also indicate muscle temperature changes. No changes to root-mean-square error or variance ratio of the force trace were observed with muscle temperature changes (both P > 0.05). Muscle temperature changes did not have a consistent effect on coefficient of variation during each plateau of the staircase contraction. Our results suggest that the ability to perform a multi-plateaued isometric force task is not affected by changes to forearm muscle temperature. As the thermal manipulation was limited to the forearm, changes to hand temperature would be minimal, thus, proprioception in the wrist and hand was preserved allowing performance to be maintained. Therefore, modest changes to forearm muscle temperature are not likely to affect force variability if proprioception is maintained. We express our gratitude to the participants for their efforts during the study. M.M.M was supported through the Natural Sciences and Engineering Research Council of Canada (NSERC) Doctoral Scholarship. The study was supported by NSERC Discovery Grants (D.A.G and S.S.C). MMM, LAG, DAG, MWRH, SSC, conceived and designed the study; MMM, GJH, and REF collected the data; MMM, GJH, LAG, DAG, SSC, analyzed the data and interpreted the results; MMM, LAG, and SSC drafted the manuscript; all authors edited the manuscript and approved the final version. The authors have no disclosures or conflicts of interest.